The next cover of local history special project “Legends of Voronezh” is dedicated to the story of the three-story mansion of the XVIII century, known as the Governor’s House Ivan Potapov. Now it houses the Kramskoy Regional Museum of Fine Arts (18 Revolutsii Avenue). Local historians call this monument “Voronezh Palace” for its resemblance to the magnificent buildings in St. Petersburg in the Baroque style. The museum staff suppose that it was here, and not in the Governor’s House on 22 Revolutsii Avenue, that the ball was held, attended by the hero of Leo Tolstoy’s novel War and Peace, Nikolai Rostov. The Potapov House is an art object, a federal monument of architecture. Its first floor ends with a cornice and serves as the basis for the two upper ones, united by large Ionic columns. Three-part division, a rusticated ground floor, which emphasizes the massiveness and heaviness of the building, a large order colonnade (columns on two floors) are all decorative elements characteristic of baroque buildings. – The rhythm of the columns itself is characteristic of baroque. If we look at the buildings in the style of classicism, the columns are equally spaced from each other. The rhythm here is ragged, with “syncopations”. In order to feel it, we even clap our hands with children, said the art historian, scientific secretary of the Kramskoy Museum, Natalya Bakina. Such magnificent houses in the Baroque style are called “house-palaces”. – The size, number of floors, its layout, architectural decoration of the house-palace has already emerged from the status of a rich town house, but has not yet reached a real palace level, explained architecture historian Viktor Mitin. Initially, the palace was not emerald, as it is now, but pink. This is evident in the watercolor of artist Saltykov, who captured the estate from the facade in 1911. – At that time, it was called “the color of the dawn.” This is the color of the XVIII century – pinkish-orange, explained Olga Ryabchikova, Director of the Kramskoy Museum. 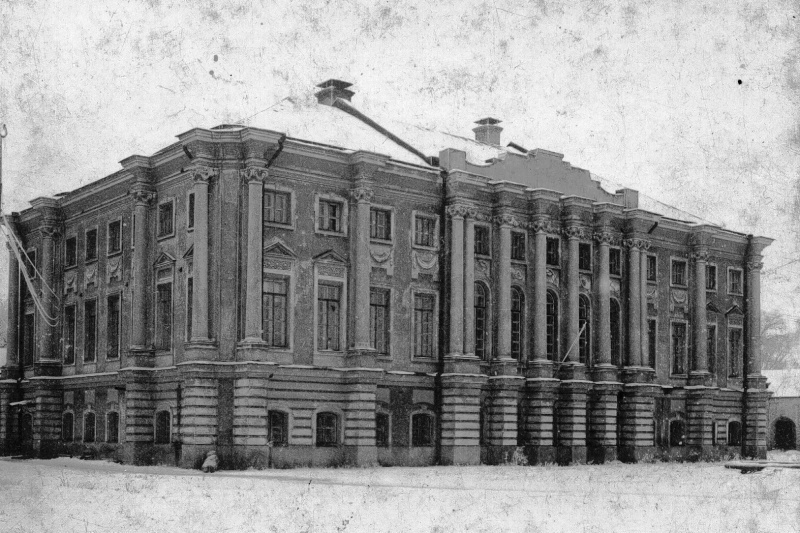 The similarity of the Potapov House with Petersburg palaces gave rise to legends, which took root in the local lore literature for a long time. They attribute the authorship of the palace either to the Russian Baroque trendsetter Francesco Rastrelli (he created the Winter Palace in St. Petersburg and the Grand Palace in Tsarskoe Selo), or architect Giacomo Quarenghi (one of his creations is the Smolny Institute). However, historian Alexander Akinshin argues that both versions are not tenable. He assumes that the building was constructed from 1777 to 1779. Rastrelli died in 1771, long before the construction of the building, and Quarenghi arrived in Russia in 1780, when the building was already built. According to Alexander Akinshin, the author of the monument was the Voronezh architect Nikolay Ievsky. He studied Architecture in Moscow at the school of the famous Russian architect Dmitry Ukhtomsky, whose work was characterized by the Baroque style. – Due to the fact that no documents have reached us since the construction of the building, the name of the architect Ievsky remains in question, the Kramskoy Museum representatives note. Another legend says that the baroque building is nothing more than a “traveling palace” for Catherine II, who was supposed to travel along the road to Tavrida and stay in Voronezh. They said that the Empress gave the palace to her favorite Potemkin. According to another version, the palace was built for the last Crimean Khan, Shagin-Giray, exiled to Voronezh. However, Alexander Akinshin refutes both legends. According to his version, during the years when the palace was built, Khan still ruled the Crimea, and Catherine II did not even plan to travel south. The true owner of the building was the Voronezh Пovernor, Major General Ivan Potapov, who arrived in Voronezh in 1775. He served as the Governor longer than all his predecessors – 16 years. At first, his family with six children settled in a state-owned apartment, which was located in the official residence, the wooden Governor’s House, built in the middle of the XVIII century under Governor Alexey Pushkin. The luxurious apartment had 16 rooms, the smaller of which was 29 square meters. However, according to Viktor Mitin, it did not suit the Governor, so he decided to build a house. Despite the fact that neoclassicism was a trend in the capital’s architecture at that time, the owner ordered the architect to build a magnificent baroque house. Obviously, it was a matter of the taste of the 55-year-old Governor. – The magnificent and pompous palaces of the nobility captivated him in the days of his distant youth, and the Governor did not see new buildings in the neoclassical style, Olga Ryabchikova is sure. But if you do not pay attention to the opinion of the snobs, Potapov’s estate with an area of 3.5 hectares has become a piece of the Voronezh Versailles. It occupied the whole block, from the current Mira Street to Tchaikovsky Street and Revolutsii Avenue. A court of honor surrounded with single-storey stone services was organized in front of the main facade in the style popular at that time. In the center of the court of honor, strictly along the axis of the house-palace, the entrance gates in the form of a three-span arch were installed. On each side, one-story corps of the services grew in pairs, forming passages from the front courtyard to the right and left to the “back courtyards” intended for housekeeping. Potapov was proud of the garden behind the house, set up by the popular “regular way” – all the alleys and paths were paved beamlike. There was a spacious stone gazebo and a fountain in the depths of the apple orchard. 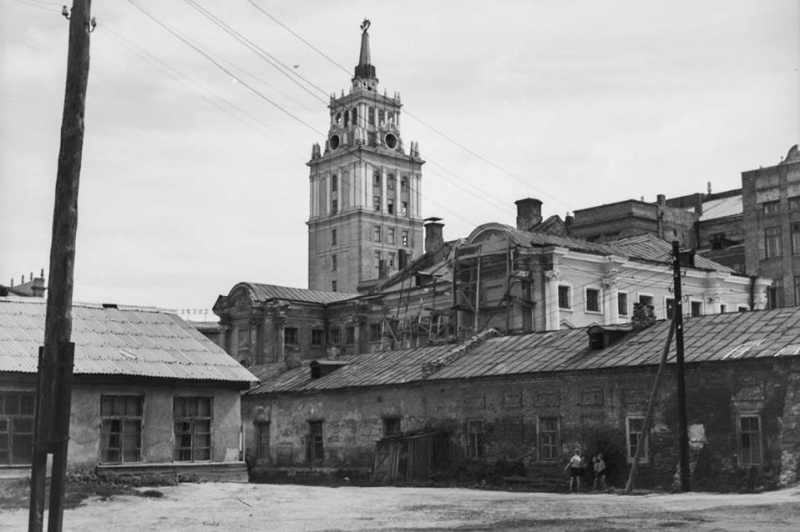 The Governor’s garden was the first landscaped garden in Voronezh – the garden itself and the courtyards of the estate were surrounded by a brick wall. Despite the fact that the premises of the house-palace were repeatedly rebuilt, it is easy to recreate the layout of the 18th century walking around the today’s Kramskoy Museum. At that time, palaces almost always had three floors. The ground floor housed auxiliary and utility premises. The second floor was impressive – it had great halls and rooms. The second floor always differed from the first and third in terms of the ceiling height. It had higher ceiling. The top floor housed the family members and guests bedrooms. As Viktor Mitin said, there was probably a succession of seven rooms on the second floor. There was a dining room followed by a narrow pantry, where the servants gave the dishes the final look before serving to the table. To the right of the dining room, there was a spacious hall, and to the left there was a square living room. The third, sleeping floor repeated the layout of the second one. Bedrooms were always smaller than the halls. – In the cold season, they had to be constantly heated. In order to somehow save firewood, the bedrooms were made much smaller, both in height and in area, explained Natalya Bakina. The hall on the second floor of the museum has preserved. As suggested by the museum staff, this hall was described by Leo Tolstoy in his novel War and Peace. The spacious hall with high ceilings has retained its old name – Romanovsky. It is here that the work of Yelena Kiseleva “Marusya” is displayed. By the way, this room “has a secret”. – This room has two tiers of windows. Its height is two-storeyed, on the third floor, you will not find a hall above it as it is closed with a blank wall. The second, upper tier of windows was called the “second-level space” of Romanov Hall in the old days, said Natalya Bakina. After the death of Ivan Potapov in 1791, his widow, Elena Krozhanovskaya, sold the estate to the state. Since then, the house has changed its owners several times. During almost the entire XIX century, the palace was under the jurisdiction of the military department – the Commissariat Commission, which was engaged in supplying troops. Provincial architect Vasily Belokopytov was assigned to prepare a project of adapting the house to military jurisdiction. Each building of the estate was planned to be turned into barracks. According to Victor Mitin, 540 people were supposed to be accommodated on all floors of the palace house, 551 military men - in service buildings, and the garden wing was to be turned into an infirmary. Belokopytov set up bunks for soldiers and designed additional Russian stoves for better heating almost in all the rooms of the ground floor. Although the estate was never actually turned into barracks, its appearance had changed. In accordance with Belokopytov’s project, its roof was replaced, tiled stoves were made, and the facade was decorated with a balcony on iron consoles. – We know about what used to be here from the memoirs of an ensign of a horse-artillery company, poet and Decembrist Kondraty Ryleev. He noted that the rooms of the palace were cold, and he was cold here, – Olga Ryabchikova told. At the beginning of the 20th century, when it was decided to hand the building over to the regional museum, the palace needed restoration. It took place from 1912 to 1914. The works were led by the first Voronezh restoration architect Vyacheslav Gain with the participation of the Moscow Archaeological Society. This was the first experience of scientific restoration in Voronezh the progress of which was monitored by art historian Georgy Lukomsky. The adaptation of the palace into the museum implied altering the interior – relatively small and insufficiently lit rooms. The layout of the palace had to be sacrificed in favour of the needed exposition space. The restoration was prevented from completion by the First World War. The governor’s house was occupied by medical and utility military establishments. 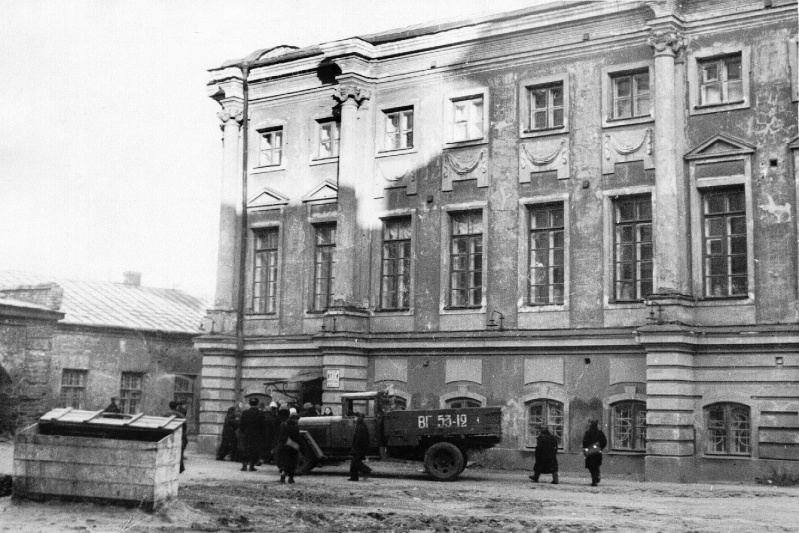 After 1917, it was occupied by Gubarkhivburo (the Regional Archive Bureau), Istpart (the regional office of the Party History Commission) and Gubzdravotdel (the Regional Department of Health). The building was finally turned into a museum only in the mid-1920s, but the Voronezh Museum of Fine Arts was founded later, in 1933. It was based on the collection of the art department of the Voronezh Regional Museum of Local History and the collection of the Museum of Antiquities and Fine Arts of the Voronezh University. Up until 1959, the palace house was occupied by the museum of local history, and after 1959 – by the museum of fine arts. The years 1930-1931 were a real test when a number of prominent museum employees were arrested under the so-called "local historian case". 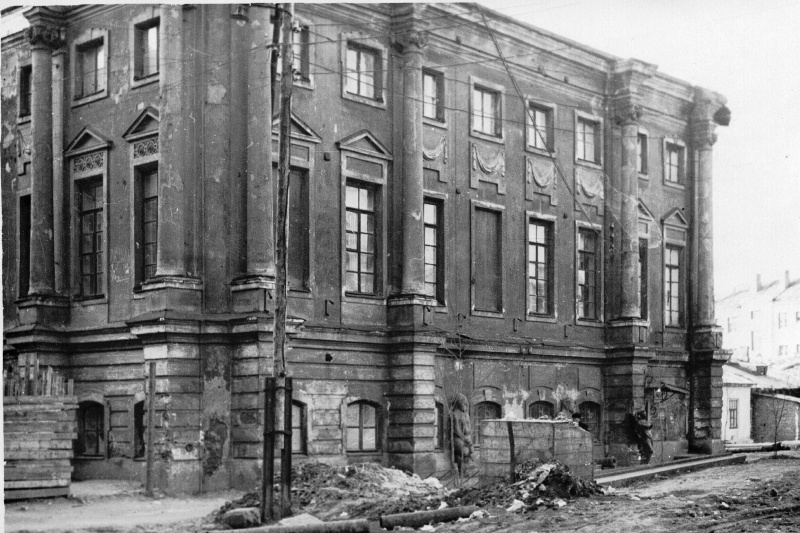 During the Great Patriotic War, the palace house was damaged. A part of the museum collection – 1.2 thousand works – was destroyed. But most of the exhibits were thanks to museum’s evacuation to Omsk. After the liberation of the city, the restoration of the palace house was worked on by architect German Zdebchinsky. In the 1930s, the palace house was blocked by the building of the headquarters of the Southeastern Railway built in front of it. In the course of the construction, the wings and the arcade of the former estate were demolished. And it wasn’t until after the war that the railways headquarters building obtained through arches through which the palace is partially visible from Revolution Avenue. And in 1984, a featureless exhibition hall was attached to the building thus blocking its rear facade. It is now the entrance to the museum for the visitors. But the adjacent narrow service entrance is an old one. Previously, the entrances to the palace house used to be located in the side facades. – One might wonder why such a magnificent building has such a narrow entrance. It turns out that making entrances in the side facades was normal for baroque-type buildings, – Olga Ryabchikova told. The door at the service entrance is old, it’s the original one. The doors leading into the halls on the second floor are just as rare. They were restored and painted white, although the decor elements on them were lost during the 1990s. But the most interesting artifacts of the XVIII century are hidden from the eyes of visitors. For example, there are preserved ancient basements, which are not interconnected. It is unknown whether they used to be connected to each other before – there are no remaining blueprints. The main basement lies under the exposition of ancient Greece and Egypt. Visitors are not allowed here, but the museum management made an exception for the journalists of RIA Voronezh. A narrow wooden staircase leads into the basement. Inside, there are old red-brick walls and vaulted ceilings typical for the architecture of the XVIII century. It is most likely where they used to keep food and wine. – In the late 1970s, the basement was filled with earth, the museum staff together with the constructers excavated it and found the roots of books left from the 1930s, – Natalia Bakina said. Another rarity is a solid wooden front staircase of the XVIII century leading to the museum collections. It is planned to be restored this year. A part of the paint has already been removed. – It has the original breakdown into flights. The higher the staircase goes, the narrower it gets, – Natalia Bakina explained. But the wooden staircase leading to the permanent exhibition, to the second and third floors, is a replica. The original one, unfortunately, has not remained.